A popular chart by the conservative think tank The Heritage Foundation is shared by thousands of people on Facebook every now and then. The chart is titled “Federal Spending Grew Nearly 12 Times Faster than Median Income.” The problem with this chart is that it does not paint a nuanced picture of how much the federal spending in the United States actually has grown. This is because one of the two plots is an aggregate number (total federal spending in dollars) and the other plot is a median value (median household income). The fact that total federal spending has grown twelve times faster than median household income since 1970 is quite irrelevant if we do not take into account the growth in the number of households. 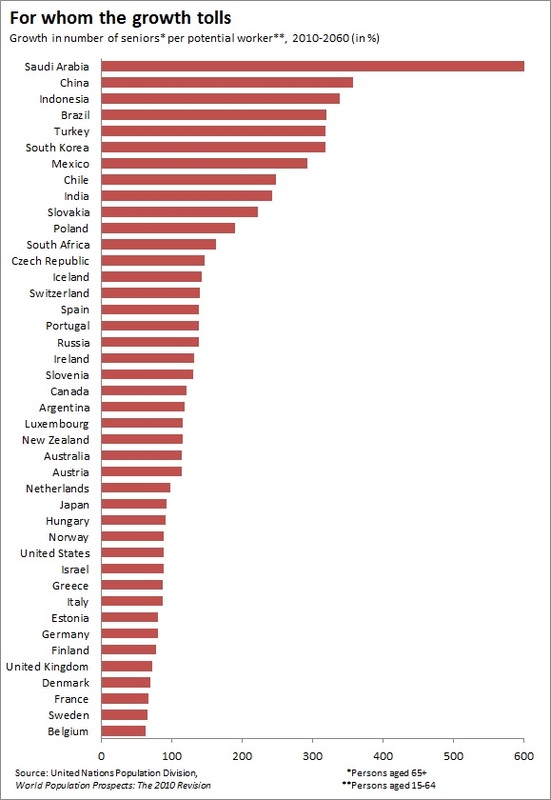 If the number of households had grown faster than federal spending, the size of the federal government would actually have shrunk (Sweden has one of the largest public expenditures per capita in the world, but imagine how small the American federal government would be if its total federal spending equaled that of Sweden). So what did the household growth in America look like? 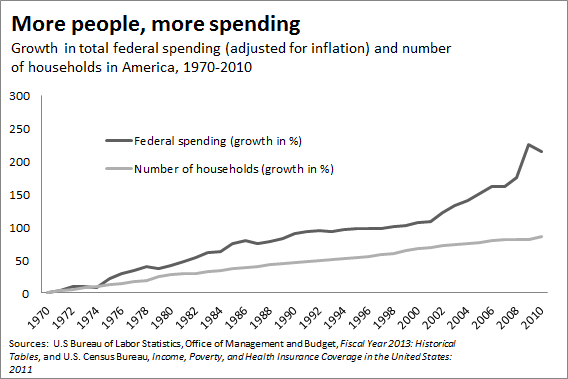 As can be seen, federal spending grew faster than the number of households. But the number of households grew substantially, and this need to be deducted from the federal spending curve in the Heritage chart if a sensible comparison is to be made. A caveat to be mentioned before showing the next graph is that it has not been possible to exactly replicate the numbers used by The Heritage Foundation. The calculations used here reaches the same number for federal spending of $3.6 trillion for 2010, but while Heritage estimates that the inflation-adjusted federal spending in 1970 was $926 billion, the number used here is $1.1 trillion. Similarly, both estimate median household income to be about $51,000 in 2010, but this blog (which copied numbers straight from the referred U.S Census Bureau report) uses a much greater number ($45,146 compared to $41,358) for 1970. So The Heritage Foundation finds that both federal spending and median income has grown at a faster rate than what this blog estimates. It is not clear from their chart which inflation-adjusted numbers they used or what price index they used to adjust for inflation, but overall this should not make too much of a difference. The general tendencies will still be the same. Especially since they find greater growth both in federal spending and in income. 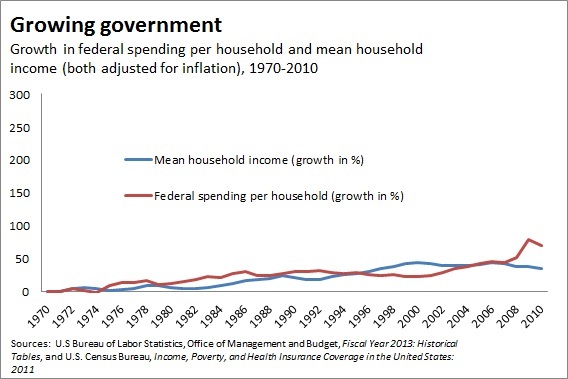 When using federal spending per household instead of total federal spending, the graph looks very different. Here is a comparison to mean household income (which might better illustrates tax-paying abilities than median income). 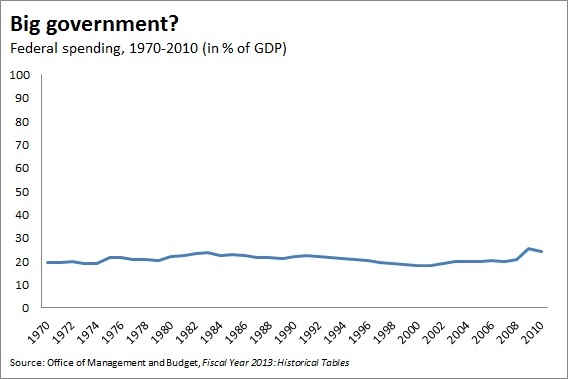 It turns out that federal spending still has grown considerably – but much less than what the Heritage chart shows. So while The Heritage Foundation is correct that federal spending has grown quite rapidly – also in per-capita terms – the magnitude is much smaller than what their chart shows. And this would be the same case if one used their exact numbers as well, simply because the number of households has grown at a fast pace. Another measure of federal spending that might add some perspective to the debate on this issue is federal spending as a fraction of GDP. The chart made by The Heritage Foundation is often referred to as a long-term trend, and one of the main reasons why the United States has piled up so much debt. But this argument seems too simplified. In terms of share of GDP, there is no trend. Federal spending was actually lower in 2008 than in 1975, and lower in 2001 than in 1970. Now, there are still good reasons to cut federal spending, but it is hard to make an argument that federal spending has grown at an explosive rate compared to income. In many countries the working-age population now constitutes the highest share seen in decades. That will not be the case in the upcoming years. The European “peak workforce” that this blog has discussed earlier is not unique for Swedes, Germans, and Italians. In fact, in most of the world’s richest countries, the dependency ratio (the number of people younger than 15 and older than 64 per person in working age) has been shrinking for the past half century. More people have, relatively speaking, had to provide for fewer people. Until now. As the graph shows, the dependency ratios will now start to increase, and do so substantially over the coming five decades. These 42 countries are the member states of either G20 or/and OECD (the EU is excluded from G20 because it is not a country). Between 1960 and 2010, only three of these states (Japan, Sweden and Germany) experienced a growing dependency ratio. In economic-demographic terms those decades were thus on average favorable. In thirty-nine countries the working-age population grew faster than the number of children and seniors. Between 2010 and 2060, in sharp contrast, only two countries (India and South Africa) are expected to face declining dependency ratios. This is related to the fact that both India’s and South Africa’s populations are predicted to continue to grow in the coming decades. The remaining forty countries are likely to have to deal with severe demographic troubles. This expected demographic pattern is worrisome for several reasons. While increasing longevity is inherently a good thing, it will increase the pressure on pension schemes and healthcare systems. An increasing dependency ratio means that unless employment is increased – through a higher statutory retirement age, sooner average entry on the labor market, or other measures – fewer will have to provide for more. Will this be the end to social security as we know it? Another troubling outlook is debt. 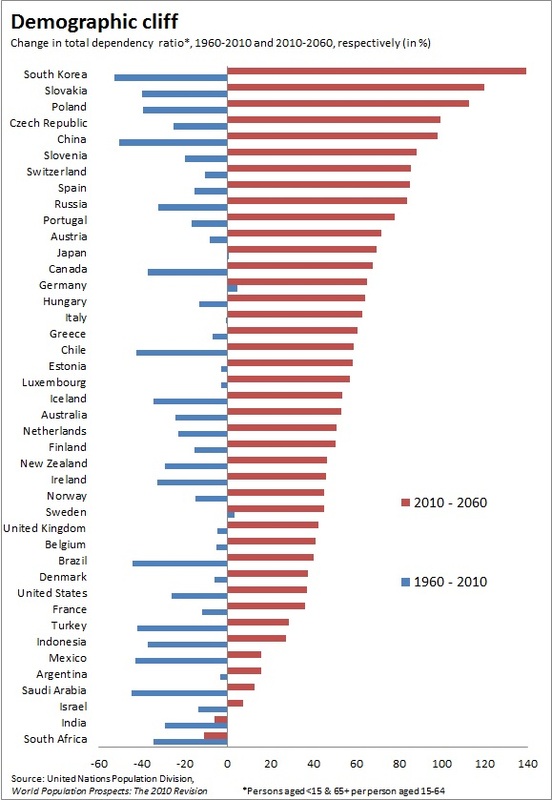 Greece, Italy, Portugal, Ireland, Spain, France, United Kingdom, Canada, and United States all piled up their debt while the dependency ratio in each country was falling, and population on average was growing. How that debt should be repaid n0w that fertility rates slow down, and the dependency ratios are set to increase is a question that is equally mind-boggling as it is alarming. There is a demographic cliff ahead. Are we going to jump or at least try to climb down? So here is something you perhaps did not know: Papandreou did actually not grow up in Greece, but here in North America. His father was teaching Economics at the University of Minnesota at the time when he was born in Saint Paul. He entered Amherst College (which enrolls fewer than 2000 students in total) with the class of ’74 together with Antonis Samaras. The two of them became roommates. In 1981 they would both meet again at the other side of the Atlantic Ocean when they were both elected to the Greek Parliament. Representing different parties, they would become members of cabinets that succeeded each other in the late ’80s and early ’90s. In 2009, Papandreou became the 182nd Prime Minister in 187 years. He followed in the footsteps of his father (174th and 179th Prime Minister) and paternal grandfather (134th, 160th, and 162nd Prime Minister). And after two caretaker governments, the former roommate Samaras succeeded Papandreou, and also became Prime Minister of Greece. Economic growth is not the only important growth issue. Another type of growth that should be discussed more often is the elderly-dependency growth; the fact that the number of seniors per potential worker is growing. Much like economic growth rates, the elderly-dependency growth rates vary greatly across countries. The economic impact and consequences for social security and budget deficits will also look different in one country from another. What they all have in common, however, is that neither has ever had to deal with the demographic problems of the magnitude that is expected. Are shrinking populations only good news? From Thomas Malthus to Paul Ehrlich and thereafter many predictions have been made regarding the effects of population growth. Malthus thought that people would be kept at subsistence level, and that productivity gains would result in population growth until the economy converged again to subsistence level. In The Population Bomb published in 1968, Ehrlich argued that overpopulation would lead to mass starvation. What we see today is a different story. Productivity gains have made obesity a bigger problem than hunger in many countries. And almost everywhere, fertility rates are falling. Some countries do even experience negative population growth. From an environmental perspective this is likely to be good news. Fewer people, holding everything else constant, implies less pollution and less extraction levels of our planet’s scarce resources. A shrinking population does, however, lead to a few economic dilemmas. First, debt is easier to service if your nominal income is rising, but nominal income growth has been very sluggish in [countries such as] Japan. Second, debt does not decline as the population falls; so the debt per capita rises, making individuals even more cautious. You are not going to go on a spending spree if you have high debts already and you are worried how you will afford retirement. Another economic problem is the effects that the changing population structure has on social security. Having a pension system where today’s workers pay for today’s retirees has worked during times of a growing economy and an increasing population. But when growth rates in many countries are slowing down and the number of workers shrink relative to the number of retirees, the pyramid turns upside-down. Indeed, as has been discussed before in Buttonwood’s notebook, and on this blog, the projected changes in dependency ratios are striking. The next post will attempt to illustrate this problem graphically. 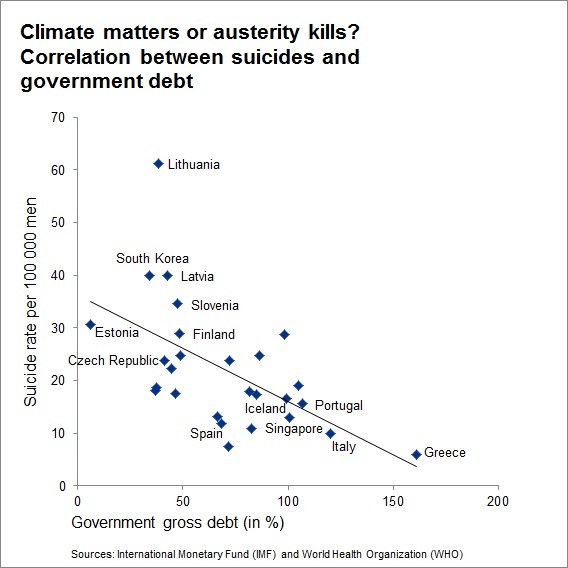 Climate matters or austerity kills? Labor Secretary Hilda Solis is resigning from the Obama administration. “Over her long career in public service – as an advocate for environmental justice in California, state legislator, member of Congress and Secretary of Labor – Hilda Solis has been a tireless champion for working families,” President Barack Obama said in a statement.